Russia's Deputy Prime Minister Vladislav Surkov speaks to Vedomosti about the success of Skolkovo and Russia's innovative development. His government duties cover both religion and innovation, and he sees no contradiction between them. 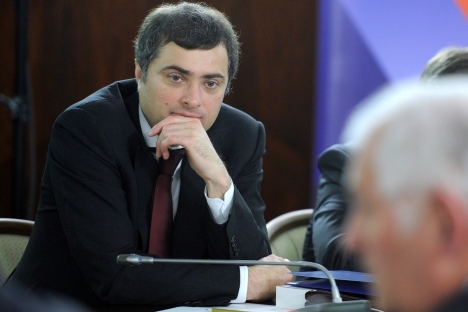 As a government minister, Vladislav Surkov oversees both science and religion – but there is no contradiction between them, asserts the deputy prime minister. After all, religious doctrines were themselves innovations at one time. Vedomosti:Oct. 31-Nov. 2 will see the holding of an event described by experts and journalists as the "Congress of Innovators." What is it exactly, and what are the main ideas behind it? Vladislav Surkov: It is a part of the Open Innovation Forum — the successor of the International Nanotechnology Forum, which ran for several years under the auspices of Rosnano. This year, the forum involves several major development institutions, among them Rosnano and Skolkovo. The result is a common platform to discuss all aspects of innovation. The discussion was joined by our foreign colleagues, some real stars: Nobel Laureate Phillip Allen Sharp, a professor at the Massachusetts Institute of Technology, Virgin Group founder Richard Branson, Ericsson CEO Hans Vestberg, and others. The forum will be attended by more than 4,000 guests. The symposium will discuss the scientific and hi-tech environment in Russia and globally. Vedomosti:The agenda is sure to include Skolkovo, where a unique set-up is being created for innovators. When will Skolkovo record its first success story? V.S. : I believe it already has. Relatively minor, but global all the same. It sounds paradoxical, but that's the way it is. Some inexpensive projects enjoy international success: for example, the News360 app, which made it into the App Store Top 10. The program allows users to systemize news reports and evaluate and filter search results according to their personal interests. As a result, less time is spent on searching for information. The app has logged more than 2 million downloads and scores at least 4.5 out of 5. Given that Skolkovo is still in the very early stages of development, a success like this (in terms of the "time-quality-price" triangle) is something that we can be very proud of. Another successful project is the company Vist Mining, which is seeking to create a "smart quarry" and to fully automate opencast mining through the use of robots. Pilot projects are being implemented at a number of domestic enterprises, including Severstal, SUEK, and Alrosa. The company is looking to IPO and put up 30 percent of its shares, in the anticipation of securing 400-500 million rubles ($12.7-15.9 million). It is not a mega-project, just really smart technology. And importantly, it doesn't use GPS, but Russia's home-grown GLONASS system. Also highly worthy of a mention is Quantum Pharmaceuticals, a company that develops flu shots. The first phase of clinical trials is already underway. For six-month-old Skolkovo, the results are not bad at all. At the moment, we have about 700 residents from 43 regions of Russia, and funding is approved for 161 projects. The grants are worth a total of 8.3 billion rubles ($264 million). Almost as much (42 percent of the co-financing) comes from outside investors: venture funds, development institutions, businesses, and the firms themselves. For us, that is a vital indicator that the market is interested in the results of every individual project. As we speak, 23 major companies are preparing to install R&D units at the Skolkovo Innovation Center, with investments worth 25.5 billion rubles ($811 million). They include some global technology giants: Nokia, Microsoft, General Electric, Cisco, Intel, Siemens, and others. Venture funds have invested 1.2 billion rubles ($32.8 million) in resident companies at Skolkovo – almost half of it foreign. Such interest in the project and willingness to participate is in itself a tremendous success. Overall, the goal is for Skolkovo to produce five Nobel laureates within the next decade. Vedomosti: You head a commission on religion. And oversee hi-tech innovation. How do you reconcile the two? V.S. : There is no contradiction. Religious doctrines were once themselves innovations – and vast in scale. For example, Christianity: never has there been such an innovative project which altered the very fabric of society in the most dominant areas of the world. It gave mankind a great deal, including the belief in one divine law. And what is modern science based upon? On the conviction that there are universal laws. It is essentially a religious belief. If there is one God, then there is one law: for example, gravity. Newton was a deeply religious man. Einstein's vocabulary also included the word "God": "God does not play dice," "God is sophisticated, but not malicious." Hawking talks about God's place in time and space. I believe that all human knowledge is of a religious nature. The scientific method rests upon the axiom that whatever is accepted without proof is an act of faith. Even atheism, in my opinion, is a relationship with God, only spoiled and somewhat confused. After all, if a teen doesn't get along with his father, it doesn't mean that the father does not exist. He does, always. I believe that the scientific and technological revolution is mankind's rebellion against its own weakness. And the first to call for such an uprising was Christ. The interview was first published in Russian in Vedomosti.ru.